NEW YORK (CNNMoney.com) -- Five vehicles from Ford Motor Co. placed at the top of their categories in initial quality, according to a survey released Wednesday by J.D. Power and Associates. The 2007 J.D. Power Initial Quality Study looks at both manufacturing defects and design problems in new cars as reported by their owners. The Ford (Charts, Fortune 500) Mustang ranked as the most problem-free "Midsize sporty car" in the survey while the Mercury Milan was the highest ranked midsized car and the closely related Lincoln MKZ was the top-ranked "Entry premium car." 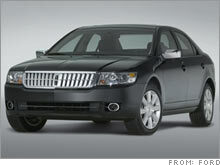 All three of Ford's U.S.-based brands - Ford, Lincoln and Mercury - earned above-average marks for quality. Ford's European luxury car brand Jaguar ranked sixth, tying with Toyota's Toyota brand. The overall top brand, on average, was Porsche (Charts) with 91 problems per 100 vehicles. (The average car in the survey had 125 problems per 100 vehicles.) The Porsche Boxster was the top-ranked "Compact premium sporty car," according to the survey. The second-ranked brand overall was Toyota (Charts)'s Lexus luxury brand followed by Lincoln, Honda (Charts) and Mercedes-Benz. The Mercedes-Benz SL-class was the top-ranked "Premium sporty car" and the E-class was the top-ranked "midsize premium car." The Mercedes-Benz S-class tied with the Audi A8 as the top-ranked "large premium car." Mercedes-Benz has not done well in J.D. Power surveys in the past but jumped 20 places in the rankings this year to finish fifth. "All Mercedes-Benz models in the study improved substantially," said Neal Oddes, director of product research and analysis for J.D. Power, in the announcement, "and the breadth and speed of these improvements demonstrates the Mercedes-Benz commitment to quality." No GM (Charts, Fortune 500) brands earned above-average scores in the survey. GM's best-ranking brand was Buick with 127 problems per 100 vehicles, a score that placed it just below average. Several individual GM models did earn top rankings, however. The highest ranking brand from DaimlerChrysler (Charts)'s U.S.-based division, the Chrysler Group, was Chrysler. Chrysler had 151 problems per 100 vehicles, placing it well below average. At the bottom of the scale, Ford's luxury SUV division, Land Rover, ranked last of all brands with 170 problems per 100 vehicles. Still, that represents a reduction of 34 problems per 100 vehicles from last year. Despite taking the top spot in the "small sporty car" segment with the Miata, Mazda finished second-to-last among brands overall with 163 problems per 100 vehicles.